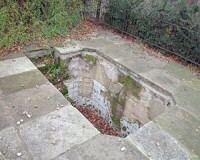 Description: This is where Princess Caroline, wife of the Prince Regent George IV's opulent sunken bath remains. Indeed, it's the only thing remaining of her Montague House, which she lived in between 1797 and 1814, when after she had vacated it, her husband raised it to the ground in disgust at her behaviour. She was renowned for her parties, fun and flirting. George decided to marry his cousin a Brunswick Princess in her own right, but when she arrived in 1795 her husband-to-be was shocked and demanded a shot of brandy. He was no oil painting himself. One of the Prince Regent's complaints was that she rarely washed, and that she changed her undergarments 'only infrequently', that personal hygiene was an alien concept, and that she ate raw onions! Caroline died in 1821 and Napoleon died the same year. When a courtier rushed to tell George 'Sire, your greatest enemy is dead! ', he replied 'No, by God! Is she? '.